Outreach workers ramped up efforts to alert the homeless about Hurricane Lane, but some opted to stay in encampments. Rain trickled down on the central Oahu town of Wahiawa on Thursday, a hint that Hurricane Lane was moving steadily closer. By late afternoon, Lake Wilson began to swell. Rose Coleman, an outreach worker with the nonprofit Alea Bridge, descended steps carved out of a muddy slope near the lake to a tent where, it turned out, a homeless woman was asleep. Coleman didn’t want to wake the woman, who she knew to be deaf, and hoped people from a neighboring camp would look out for her if the storm brought water gushing up toward her encampment. Outreach workers across the state ramped up their efforts to inform unsheltered homeless people about Hurricane Lane’s approach. Lila Marcellino is one of 189 people still living in a longtime homeless encampment at the Waianae Boat Harbor as the hurricane approaches. Coleman and two other outreach workers drove from one homeless encampment to the next. Of the roughly 20 people she talked to Thursday, just five agreed to enter designated evacuation centers in gyms or cafeterias of public schools. Stanley Poohaakueanu, whose tent is a few yards from Lake Wilson, lived in Haleiwa Beach Park on Oahu’s North Shore during Hurricane Iniki in 1992, the last major hurricane to hit the island chain. He described that storm, which decimated Kauai, as “an ordinary day” where he was. There are an estimated 4,495 homeless people living on Oahu and 6,530 statewide, according to the latest point-in-time count. Many plan to ride out the storm in the tent encampments where they live. 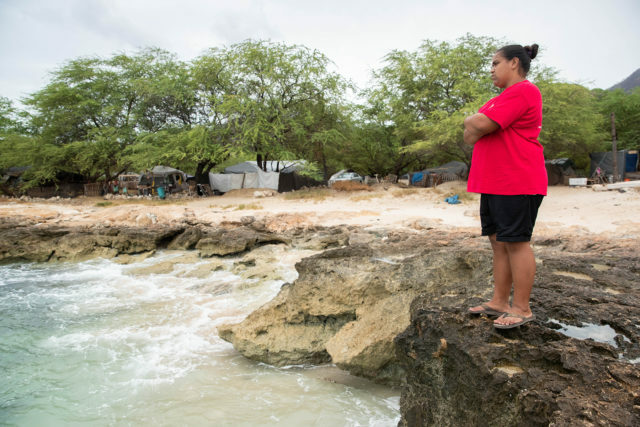 Such was the case at the Waianae Boat Harbor, where 189 of the usual 250 residents of the longtime homeless camp were still residing Thursday, near the ocean’s edge. 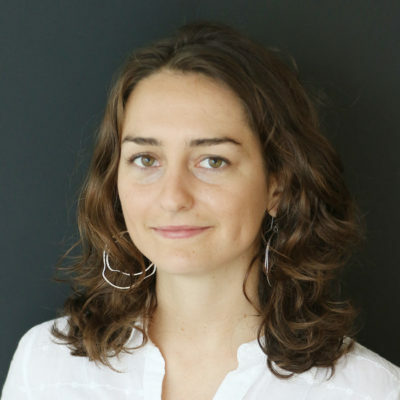 Camp leader Twinkle Borge told Civil Beat earlier this week that 28 children from the camp had been relocated to stay with family or friends, but that most of the adults planned to stay. By 4 p.m. Thursday, 15 people found shelter in the cafeteria of Leilehua High School in Wahiawa. Coleman sat with one of her clients outside, coaxing him to stay put and avoid the liquor store. She said she has 60 to 80 clients who are homeless or recently housed, all of whom abuse drugs or alcohol. More than 430 people had entered evacuation shelters across Oahu by Thursday afternoon, according to city spokesman Andrew Pereira. The shelters hosted a mix of people, including Oahu residents and tourists looking for a stable place to wait out the storm. 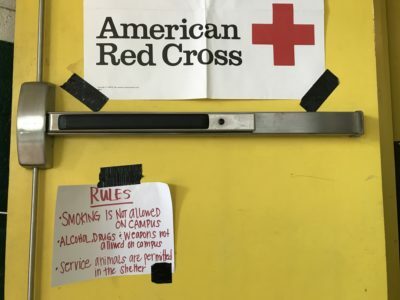 A sign on the door of the Leilehua High School cafeteria informs people using the evacuation shelter of the rules. Justin Phillips was one of 12 outreach workers with the Institute for Human Services who combed the streets of Honolulu and Windward Oahu this week shepherding homeless people to shelters. At noon Thursday he leaned against a pillar near a bus stop in the parking lot of Ala Moana Shopping Center. Tourists bustled past and exhaust rose from the engines of passing buses and cars. Phillips estimated he had talked with 100 homeless people over the course of two days and that half had entered evacuation shelters. “Most of the response is, ‘I’m OK, I’m fine,” he said. Phillips gave out fliers with a list of the public schools that double as evacuation shelters and a location where people could board a bus headed for Kaimuki Middle School, one of the shelters. City buses were free for anyone who needed a ride to an evacuation shelter Thursday until 6 p.m., when the bus system ended all regular service for the duration of the storm. 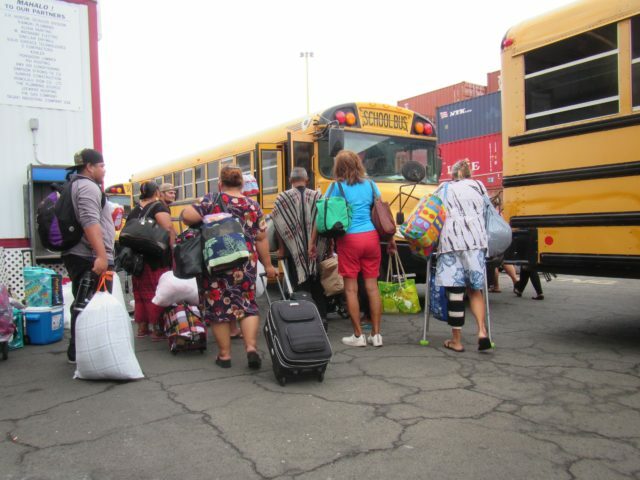 The city also provided buses to evacuate seven homeless shelters on Oahu, including Hale Mauliola on Sand Island near Honolulu Harbor and a shelter run by U.S. Vets in Waianae. Thirty families living in Kahauiki Village, a permanent housing project along Nimitz Highway, also evacuated to shelters or left to stay with family or friends. After a conference call with city officials and homeless service providers Wednesday afternoon, Jason Espero, the director of homeless services for the nonprofit Waikiki Health, decided to prepare all 135 adults who live in Next Step homeless shelter to evacuate Thursday morning. The 135 homeless people living at Next Step shelter in Kakaako packed their possessions and headed for McKinley High School. “We’re right on the water, literally a stone’s throw away,” Espero said. Next Step is adjacent to Kakaako Waterfront Park in downtown Honolulu. The storm had people living at Next Step feeling jumpy and excited, said Benito Peloli, who has lived there for two months. He rode in a school bus that Waikiki Health rented from local tour company Roberts Hawaii and brought with him two packs of instant ramen and two cans of Vienna sausage. Staff at IHS worked overtime Thursday pulling out mats to convert the dining room of the Kaaahi Women and Family Shelter into a sleeping area. “Even if that does fill, we do have space in different pockets of the facility so no person will be turned away,” said Kimo Carvalho, a spokesman for IHS.